Hello, crafting friends! My oldest and dearest friend's birthday is this month and this is the card I made for her. My creative juices were flowing at a snail's pace so I searched around the Internet and finally got inspired and created this card. I just love how it turned out! The base card was made from GKD White card stock. It was layered with SU Blushing Bride, followed by GDK Black Onyx card stock. The focal layer was embossed with SU Square Lattice EF. The sentiment was personally composed and computer generated and then cut with a die from Spellbinders A2 Distressed Edges. This was then matted in GKD Black Onyx. The shopping bags were cut using Memory Box Gift Bag dies on various patterned papers from my stash. I adhered the names of major department stores and added tissue paper to make the bags more interesting and give the card more appeal. Both the sentiment and bags were adhered with dimensionals. I added an image of a gift bag with the words "wishes" floating out of it. Hope you enjoyed this post and will be inspired to create something awesome today! Ooooh I LOVE this, have seen it out on the web too, haven't made one as yet. Yours has came out beautifully! Really spectacular! Well done! 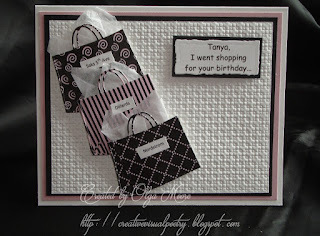 I absolutely love this cute card creation and I am sure your friend will too. Super cute idea, and I love the verse inside. Love your colors, heck, love the whole card.